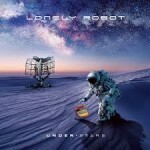 Share the post "Album review: LONELY ROBOT – Under Stars"
‘Under Stars’ sees John Mitchell bring his Lonely Robot project trilogy to a finale. Joining him on this one are drummer Craig Blundell (Steven Wilson, Frost*) and bassist Steve Vantsis (Tilt, Fish). Available on vinyl as well, it is worth noting that the CD digipak adds three extra songs. Starting, as on the previous two albums, with a Sci-Fi cinematic instrumental opener on ‘Terminal Earth’ the album kicks in with ‘Ancient Ascendant’ which is a typical Lonely Robot song, which in itself shows what a unique sound John Mitchell has built up over these three albums. What is the sound? Progressive music with a distinct melodic vibe and cleverly mixing SF themes and lyrics that resonate in the modern day. ‘Inside The Machine’ is another song with the Lonely Robot trademark sounds all over it. The aforementioned synthwave pop comes through loud and clear on ‘Icarus’, which features plenty of synths and a hypnotic bassline, makes for fantastic listening. ‘The Signal’ is a quieter song, John Mitchell’s slightly robotic vocals drifting in and out over a wondrous soundscape featuring synths, muted guitar and drums. ‘When Gravity Falls’ goes for the juggler on the ills of social media, set to a suitably prog metal backing. A heavy keys solo leads into the telling lyric ‘All I want is to feel something, I just want to belong’. ‘Please Come Home Lonely Robot’ returns in the album’s final track ‘An Ending’, which features parts of ‘Please Come Home Lonely Robot’ that have been on the previous albums. Gentle vocals, synths and piano combine to good effect. It leave it open for the further adventures of the Lonely Robot? The only downside to this album is that it is the last one to bear the Lonely Robot name, otherwise ‘Under Stars’ will delight and amaze those who have enjoyed the first two albums. If you haven’t heard these what are you waiting for? Go get them now. This entry was posted in ALBUM REVIEWS, ALBUM REVIEWS (Mobile), All Posts and tagged album, Inside Out, John Mitchell, Lonely Robot, melodic, pop rock, progressive, review, rock, space rock, synthwave, Under Stars. Bookmark the permalink.